I am wondering where to start learning to swim? 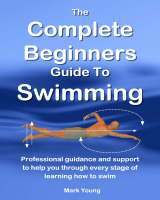 What is best to concentrate on to start with when you first begin to learn to swim? As a beginner learning how to swim for the first time, the most important parts to concentrate on will depend mostly on your level of confidence to begin with. Some people come with confidence built in whereas others come with a complete fear of water and fear of swimming. For those that are comfortable in the water and have some confidence it is important to learn how to stop and stand up mid swim. That is of course along with the basics of learning how to kick and how to pull with the arms. Adult beginners can choose between learning front crawl or learning breaststroke and most usually find breaststroke the easiest to learn to start with. If you have a fear of the water or lack confidence then the areas to must become comfortable with to start with are getting the face wet and submerging under the water. That is along with all the other basics of learning to swim such as arm pull and leg kick techniques and stopping and standing mid-swim. If you lack confidence you must take each step slowly and gradually, progressing at your own pace and trying out new things only when you are comfortable to do so. How Hard Is It To Learn To Swim? I'm an adult that has avoided swimming over 30 years. I want to desperately break my fear. How hard is it to learn to swim? Learning to swim as an adult is not nearly as scary as you may think. Breaking your fear of the water or your fear of swimming is a matter of learning how your body behaves in the water and how it feels to be moving about in the water, without necessarily swimming at first. The most obvious thing to do is get yourself some swimming lessons with a qualified swimming instructor, either in a class or one-to-one privately. There are plenty of swimming lessons for adults. Do not be embarrassed or nervous. For every adult that bites the bullet and goes for it, there are hundreds that still wish they could do just that. If swimming lessons are not for you then go to the swimming pool with a friend or relative as support. Get into the shallow part of the pool and just move about. Walk around, go slightly deeper, maybe up to chest depth and walk about. Get a feel for how your body behaves in the water. Next is to practice submerging or putting your face into the water, holding your breath, blowing bubbles, all that stuff. Use some swim goggles if necessary as they can enhance your confidence. Once you have become confident with submerging (whilst still standing on the pool floor) then your fear of water or fear of swimming is well and truly on the way to being conquered. Learning to swim from there is a piece of cake! Learn how it feels to lift your feet off the pool floor and float or kick your legs. You can do this holding the poolside or onto your supportive assistant. Learning to swim a particular swimming stroke such as breaststroke or front crawl is just a matter of what to do with your arms and legs. It is learning to deal with floating, submerging and regaining a standing position from swimming that really makes a difference to someone with any kind of fear of swimming. Learn at your own pace. Rome was not built in a day and everyone learns to swim at different rates. Practice and determination will prevail and you will soon be enjoying one thing you have always wanted to achieve.